Preview: The time is now for the San Francisco 49ers to show the world if they’re a legit contender or just another victim on the Saints road to the Super Bowl. It’s time for the immovable object to battle the unstoppable force. The 49ers finished the regular season with their best record since 1997 at 13-3. They also clinched their first NFC West divisional title since 2002. Under new head coach Jim Harbaugh, the 49ers became a feared defensive minded football team. They featured one of the most dominant rush defenses the league has ever seen. San Francisco allowed just 3 rushing scores the entire year, all of which came during the final 2 games of the season. Despite competing in one of the weaker divisions in the NFL, the 49ers still picked up wins over quality opponents who all ended up qualifying for the postseason (Steelers, Lions, Giants). Quarterback Alex Smith was a revelation for the 49ers. The once highly criticised starter finished with 3144 passing yards, 17 touchdowns and just 5 interceptions, his lowest total since 2007 in which he only played half the season. Last weekend against the Detroit Lions, the Saints put up the greatest offensive showing in postseason history. New Orleans finished with 626 total yards, breaking a record that had stood for over 49 years. Drew Brees torched the Lions secondary for 466 yards through the air and 3 touchdowns. In 7 career postseason starts with the Saints, Brees has 16 total touchdowns and just one interception. He is currently riding a streak of 215 straight passes without throwing a pick. 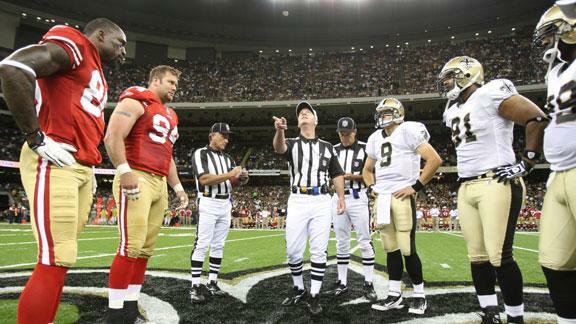 Fun Fact: The New Orleans Saints have only played 4 road playoff games in franchise history. The Saints lost all 4 of them. Big Question: We all know the 49ers are capable of stopping the run, but are they capable of stopping Drew Brees and the Saints passing attack? Final Pick: San Francisco has a lot of positives going for them in this game. The game is being played at Candlestick Park where the 49ers are an impressive 7-1. The game is also taking place outdoors which is a huge advantage for San Francisco. The Saints have played only one game outdoors since October 16. New Orleans is a mediocre 3-2 outdoors this season, with 2 of those victories coming on last minute plays. Despite all of that, I just can’t pick against Drew Brees at this point and time. I love what the 49ers have been doing on the defensive side of the ball this season, but what Brees has been doing for the Saints offense is the stuff of legends. Momentum is so important in the game of football and the Saints have all of it right now. San Francisco can clearly stop the run, but running the football was never the focal point of the Saints offense anyways. New Orleans will hand the ball off to Pierre Thomas and Darren Sproles on occasion, but the Saints are clearly going to have to give the ball to Brees in red-zone situations. Preview: When I look at this years New York Giants team and their recent on-field performance, I get this weird feeling that I’ve seen this whole scenario play out before. Back in 2007, the Giants played the undefeated New England Patriots on the last game of the season and took them to the brink of defeat. When the Giants entered the playoffs, they had all the confidence in the world that they could hang with the best team in the league. They then proceeded to knock off the Cowboys, Packers and still perfect Patriots to win the Super Bowl. During week 13 of this season, the Giants took the undefeated Green Bay Packers to the limit as well. Ultimately, they would lose the game 38-35, but they showed that if they met again in the playoffs, they were capable of hanging with Aaron Rodgers and the defending Super Bowl Champions. The Green Bay Packers enter this postseason matchup with the best record in the NFL at 15-1. Aaron Rodgers had himself a MVP-type season finishing with 4643 yards, 45 touchdowns and just 6 interceptions. If not for a late season blunder against the Kansas City Chiefs, the Packers would have been only the third team in NFL history to finish a season undefeated. 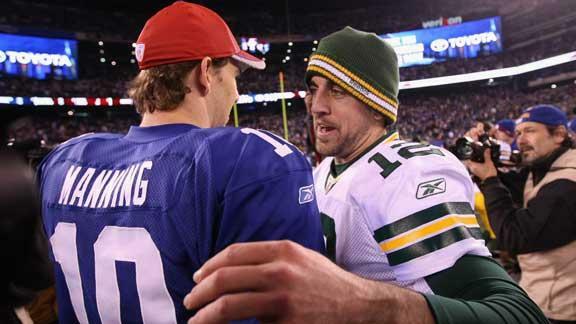 Big Question: Can the New York Giants pass-rush get to Aaron Rodgers? Final Pick: Ladies and gentleman, it’s time for an upset. The New York Giants are going to win this football game. Just like in 2007, the Giants are hot at the perfect time. Last weekend, they took a potent Atlanta Falcons offense and made them look like pushovers. Jason Pierre-Paul (16.5 sacks) is leading a Giants defense that is only allowing an average of 10 points to opposing teams over the last 3 games. The Green Bay Packers offense is rolling, but that still doesn’t overshadow the fact that they have the worst defense in the entire NFL. With Eli Manning playing the best football of his career and the Packers defense in disarray, it will put more pressure on Aaron Rodgers to keep up with Manning and his offensive output. I expect Victor Cruz and Hakeem Nicks to benefit from a huge passing game from Eli Manning. This entry was posted in NFL and tagged Aaron Rodgers, Alex Smith, Darren Sproles, Drew Brees, Eli Manning, Football, Green Bay Pacers, Jordy Nelson, New Orleans Saints, New York Giants, NFL, NFL Playoffs 2012, Patrick Willis, San Francisco 49ers, Victor Cruz. Bookmark the permalink.